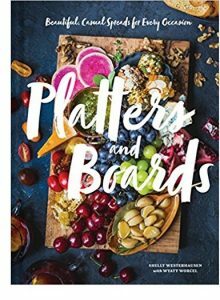 My fondness for food served on boards and platters is well documented on these pages, so you can understand why I am in love with this book: Platters and Boards: Beautiful, Casual Spreads for Every Occasion by Shelly Westerhausen, with Wyatt Worcel. Flipping through this book has given me tons of great ideas to spice up my own boards and the courage to try something daring. Platters and Boards: Beautiful, Casual Spreads for Every Occasion by Shelly Westerhausen, with Wyatt Worcel is available from Amazon and other fine booksellers. Lost Cowboy is powered by	WordPress 5.0.4 and delivered to you in 0.966 seconds using 45 queries.